Find out how to watch all the action for the 2018 Reebok CrossFit Games Regionals. 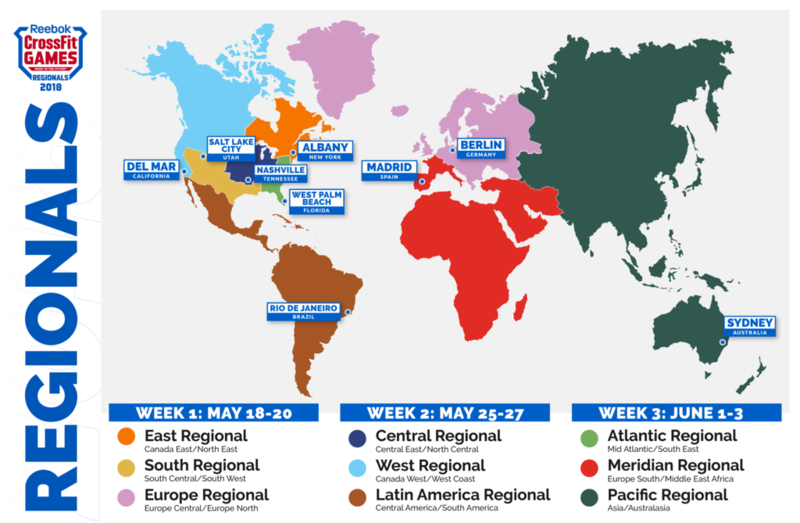 Regionals are where the fittest athletes and teams in each region come together to compete and celebrate affiliate communities around the world. At the end of the weekend, the fittest will earn their place to the CrossFit Games. If you can't make it out to see the competition in person, get ready to kick back, kick up your Nanos, and watch all the action from the comfort of your living room. We recommend planning watch parties, because everything's more fun with friends, but you do you. You will have several options for watching every exciting moment of all nine Regional competitions: Every heat will be broadcast live on Facebook Live, Games.CrossFit.com, CBSSports.com and the CBS Sports App. Also, if you enjoyed the Games on CBS, we have good news for you: This is the first time that Regionals will be broadcast on TV. Scroll down to view complete details and times for all viewing options. Click here for Regional dates, locations and additional details. Every heat of every event of the Regionals will stream live right here on Games.CrossFit.com. The Games player allows you to seamlessly switch between live events on mobile, tablet or desktop devices. We'll also keep the archived footage here so you can rewatch the competition or catch up on what you missed. Plus, we'll bookmark all the key moments in every heat so you can jump to the right moment to watch your favorite athlete or team compete, or tune in just to see Mat Fraser take the other competitors to school in the final heat. You can also watch all the action and engage with the community and broadcast team right on social media through Facebook Live. We'll help you organize your notifications if you don't want to miss a moment. We can let you know when events are starting through Facebook groups. Launch your browser and go to www.facebook.com. Search for "The CrossFit Games." Follow the "The CrossFit Games" show page to receive updates. Download and/or launch the Facebook app on your phone or tablet. Download the Facebook video app on your TV or streaming device and search for "The CrossFit Games." You can also stream the competition from your phone to a TV on the same wifi network by tapping the (TV) icon. How Do I Watch on Facebook Without Comments? To hide comments and reactions in a live video you're watching on your computer, hover over the live video, then click on the quiet mode button. Click on the quiet mode button again to bring back comments and reactions. To hide comments and reactions in a live video you're watching, swipe right across the screen. Swipe left to bring them back again. Or tap the screen to bring up the quiet mode button, which you can tap to hide comments and reactions and tap again to bring them back. CBSSports.com for desktop and mobile web. The video player will feature separate channels for each region and VOD content including previews, recaps and more. CBS Sports will showcase the CrossFit Regionals for the first time, featuring coverage across broadcast, cable and digital platforms. Television coverage begins on Saturday, May 19 (11 a.m. PT / 2 p.m. ET) on CBS, while streaming coverage of the event begins on Friday, May 18 (12 a.m. PT / 3 a.m. ET) on CBSSports.com and the CBS Sports app for mobile and connected TV devices. If you are outside the CBS coverage area and want to see Regionals on TV, contact your local service provider to express your interest, and tune in on the Games site to enjoy unforgettable action! CBS Sports Network, the 24-hour home of CBS Sports, is widely available through all major cable, satellite and telco distributors, as well as via OTT streaming service providers such as YouTube TV, fuboTV, PlayStation Vue, DirecTV and Hulu. Additionally, a live CBS Sports Network stream is available through CBSSports.com and the CBS Sports App by authenticating with select providers. For more information, including a full programming schedule, go to www.cbssportsnetwork.com. Check in on the Regionals from your mobile device with the CrossFit Games App (available for iOS and Android). keep track of which athletes and teams are in the top spots at each Regional and in contention for spots to the Games. interact with the CrossFit Games Leaderboard to see how your favorite athletes and teams are doing. This year you can check athletes' rankings at individual Regionals, or compare performances across different Regionals. Stay connected with Regional coverage on social media through the CrossFit Games digital communities on Facebook, Instagram, Twitter and Pinterest. Tag CrossFit Games and use the official hashtags to be considered for reposts and shares. Local - Use #SupportYourLocalBox and share stories of your local CrossFit affiliate coming together to participate in events around the world. Questions? Ask in the comments and don't forget to check the Help Center.